Veterans for America delivers an early holiday present to our nation's military families: "The American Veterans’ and Servicemembers’ Survival Guide," a 599-page guidebook every veteran should own. And there's no need to worry about being naughty or nice, because the VFA Santa has made the ebook available to everyone as a free download. Earlier this month, NPR introduced listeners to John Blaufus, an Iraq veteran who's been hospitalized twice for acute PTSD since returning home. The segment was the latest installment in their important "Impact of War" series. Australian researchers have found that "elevation of the heart and respiration rates, which occur immediately after a traumatic event, are predictive of future PTSD." At Camp Pendleton this past Friday, a summary court-martial was held for a Marine who had gone AWOL for two years and faked his own death, all to keep from deploying to Iraq for a third time. His attorney had argued that he had a nervous breakdown after his experiences in Iraq, which included the death of a close friend who had been killed while taking his place on duty one day. In the unique case, the Marine, who grew up in Saudi Arabia as the son of oil company school teachers, has been discharged. Another court-martial case, this one of a Silver Star Afghanistan veteran and Air Force Captain whose actions in 2002's Operation Anaconda saved three men's lives, has ended with the officer's retirement. "Who rescues the rescuer?" asked the helicopter rescue pilot's attorney, whose PTSD was not recognized officially by the Air Force until the end of his tour when he'd already sunk deeply into illegal and erratic behavior. A recent study of 140 returning Rochester/Finger Lakes [NY]-area veterans, family members and service providers has found that military families "struggle needlessly because they aren't aware of benefits and services available or don't think they need them. ...The report says soldiers and families need honest information about the pitfalls of reintegration, signs to look for, strategies for coping and the fact that it's common to struggle." UPI delivers a thoughtful dose of reality and reflection in "Invisible Wounds," a documentary now available online in full. Hosted by Nick Clooney, Part 1 explores the rigors of combat through the reflections of those who have been sent to wage it through the years. Part 2 takes a look at the aftermath, including PTSD. And Part 3 discusses the road to recovery, and calls on society to help with the homecoming of its veterans. Interviews with returning soldiers and their families bring to light the rarely discussed challenges they face back home. Further interviews with Vietnam and World War II vets add perspective to the problem, showing that it is not something new. The film was created by American Life TV. These issues impact many American families whose loved ones have dedicated their lives to the service of this nation When you take those who have served and are serving and add all their relatives and dependents you have a huge number of people whose livelihoods and happiness is directly affected by military service. The country owes them a tremendous debt and it is more than fitting that a major news outlet devotes time and space to informing them and the general public on the issues that matter most to them. UPI is proud to present "Invisible Wounds" on its new U.S. Military Matters feature page... The page will serve the interests and address the concerns of current and past members of all branches of the military and their families. Fort Campbell is considered one of the main "crossroads" of our military campaigns in Afghanistan and Iraq, with troops ever revolving through its doors to and from service in the Middle East. The rapid tempo of its operations has applied special stress and strain on its community. By October 2007, the base had reported nine suicides in its ranks that year. The home of the 101st Airborne Division, its commanding general squarely turned his attention on the crisis when three of those suicides took place in the span of just two weeks. At the time, Maj. Gen. Jeffrey J. Schloesser wrote in a letter to the post community: "This is unacceptable and it must stop. I want everyone associated with Fort Campbell to take pause, and to focus on what we can do as a community to reverse this trend." Schloesser, now being deployed to Afghanistan, find his work must be picked up by acting senior commander for the 101st Airborne Division, Brig. Gen. Stephen Townsend. On his promotion this past weekend, Townsend applauded the reintegration program, calling it "superb." That program will be tested as some 15,000 of Ft. Campbell's soldiers once more return home after serving for more than a year in Iraq and Afghanistan. Leaders are aggressively attempting to meet the challenge of caring for them. Will the upcoming change in VA leadership result in fewer facility closures? Congressman Jerry McNerney [D-CA] hopes so. In a letter to President-elect Barack Obama's VA secretary nominee, Gen. Eric Shinseki, McNerney (who serves on the House Committee on Veterans' Affairs) has asked that Livermore VA medical facilities not only remain opened but be expanded to include a PTSD and major depression treatment center. Great news coming out of the home of the 3rd Infantry Division today as "medical officials at Fort Stewart’s Winn Army Community Hospital will take part in a ground-breaking ceremony for two clinics dedicated to the treatment of post-traumatic stress disorder (PTSD) and traumatic brain injuries." The issue of combat PTSD reaches a national audience today on Dr. Phil. "Beyond the Front Lines" features the stories and far-too-often struggles of some of our returning troops. [UPDATE Dec 20, 2008]: Larry Scott of VA Watchdog has uploaded the full program on YouTube, which I've added in extended below. In Ohio, following years of effort by veterans Tom Shugerts and Paul Nelson, 2009 will usher in the newly-designated Ohio Veterans Memorial Bridge. The pair's idea inspired the bill now expected to be signed into law by by Gov. Ted Strickland. More news over at Jon Steinman's greatly-recommended daily Veterans for America News Analysis column. Bookmark it! 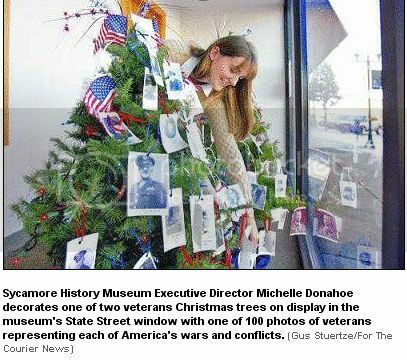 Recent stories that bring to life the many ways that we honor our veterans during the season of tinsel and light. The ever-enlightening webcast series In Their Boots ran the heartbreaking story of Jeffrey Lucey -- a Marine who'd served during the initial invasion of Iraq and returned home safely only to commit suicide less than a year later, on June 22, 2004. He would be among the first wave of OEF/OIF suicides, leaving his parents, Kevin and Joyce Lucey, to be on the leading edge of the senseless pain now known to hundreds of military families. While some suffer in silence -- a choice that is certainly to be fully respected and understood -- the Luceys were among the first to come forcefully forward to sound the alarm on the issue of suicide and our returning troops. Their story was again presented in a two-part In Their Boots segment, "The War Within," this month that I wasn't able to post on due to my finals. Dr. Judith Broder, Director of The Soldiers Project, joins the Luceys in the first episode (which ran on December 3), and Paul Sullivan, Executive Director of Veterans for Common Sense, adds his knowledge to the discussion to the second (which aired December 10). The videos are now up on YouTube. For some reason, the YouTube audio is not working for the first segment; please view Chapter 1 at the In Their Boots site (you can also view Chapter 2 along with supplemental clips). The U.S. Army intentionally denied benefits to soldiers suffering from a widespread stress disorder after they returned from service in Iraq and Afghanistan, a veterans advocacy group charges in a suit filed Wednesday. All disabled veterans are assigned a disability rating from zero to 100 percent. According to the Legal Services Program, a rating of at least 30 percent is required to qualify for benefits such as monthly disability payments and free health care. Soldiers receiving less than a 30 percent rating are entitled only to a one-time lump sum severance payment after being discharged. On October 14, the Defense Department ordered the Army to assign at least a 50 percent rating to all soldiers discharged with PTSD in the future. The lawsuit seeks to provide full benefits to all veterans discharged with PTSD in the past six years. 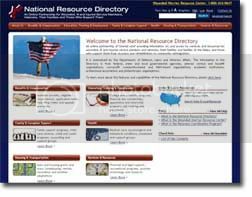 The Department of Defense [last month] launched the National Resource Directory, a collaborative effort between the departments of Defense, Labor and Veterans Affairs. Located at www.nationalresourcedirectory.org, the directory offers more than 10,000 medical and non-medical services and resources to help service members and veterans achieve personal and professional goals along their journey from recovery through rehabilitation to community reintegration. I've been among those calling for something like this for some time now. Yet again this week I found myself carrying on about the need for such a database in an email exchange with the organizers of next month's Survivor Corps Community Reintegration Summit at the Carnegie Institution (I have been invited to attend). It looks like we're getting closer to that goal. For years, I've been an unapologetic and unabashed fan of what I believe is the best guide to reintegration and transformation of both veteran and society: the book, "War and the Soul: Healing Our Nation's Veterans from Post-traumatic Stress Disorder." Written by Dr. Edward Tick, it was recommended to me by a Vietnam vet and friend as I began my research on my own slim volume. Since then, I've had the chance to attend two of Tick's highly-recommended workshops over the years. And what I've observed is this: Tick is a soldier of service, providing warriors and civilians alike a chance to consider their impact on one another. His organization, Soldier's Heart, brings into being the ideas set down on paper in War and the Soul; the organization does a top job of bringing these two groups together to share each others' concerns and work toward solving each others' problems. It's not a mistake to say that Dr. Tick and all of the people who work at Soldier's Heart have inspired me. And I'm not alone. Their work has also admittedly inspired Lisa Rosenthal, an author, playwright, writing coach and workshop leader who has transformed that inspiration into the ongoing Vet Art Project. Study Finds PTSD Risk Rooted in Stress as Neuroscience Field Bids Farewell to "Patient H.M."
Last week, Henry Gustav Molaison -- a name most would not recognize even though he was the neuroscience field's most famous of patients -- passed away at the age of 80. Since 1953, when experimental brain surgery to alleviate severe epileptic seizures severely damaged his ability to lay down new memories, Molaison was known simply as "H.M."
Henry Gustav Molaison (February 26, 1926 – December 2, 2008), better known as HM or H.M., was a memory-impaired patient who was widely studied from the late 1950s until his death. His case played a very important role in the development of theories that explain the link between brain function and memory, and in the development of cognitive neuropsychology, a branch of psychology that aims to understand how the structure and function of the brain relates to specific psychological processes. Before his death, he resided in a care institute located in Windsor Locks, Connecticut, where he was the subject of ongoing investigation. Audio recordings from the 1990s of him talking to scientists were released in early 2007. Henry loved to do crossword puzzles, play bingo, watch TV, and socialize with the people who took care of him. Not surprisingly, in February 2007, NPR's Weekend Edition [listen] introduced their audience to the man whose ill-fated surgery gave scientists a clearer window into the body's most complex and vital organ: the brain. 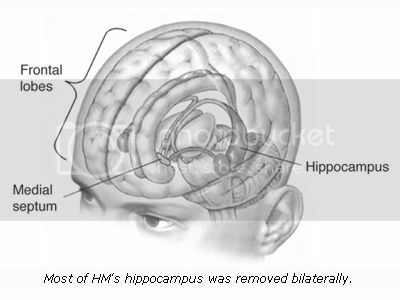 The program also provides a short introductory primer on memory and the brain. Due to PTSD and memory's unique relationship -- with past traumatic experiences feeling vivid, painfully immediate and even more "real" than recent events rather than the distant memories they should be for its sufferers -- H.M. (who was an "n of 1," or the only person who is known to have had the surgical procedure performed on him; therefore, the only one available in this specific research pool) increased our knowledge base in this area, too. In extended, a journey into the world of Molaison's amnesia, along with a host of fresh research coming out on the subject. Who says nothing's for free? Tomorrow -- Wednesday, December 10 -- is the last day to participate in the Red Cross Holiday Mail for Heroes program. The program is a "partnership between the American Red Cross and Pitney Bowes to deliver one million holiday cards to American service members, veterans and their families in the United States and around the world." Download free postcards [pdf] or mail your own to the address below, following all the rules listed in extended. With 153 hospitals and about 745 community-based clinics, VA operates the largest integrated health care system in the country. VA’s medical care budget of more than $41 billion this year will provide health care to about 5.8 million people during nearly 600,000 hospitalizations and more than 62 million outpatient visits. The community-based outpatient clinics, or CBOCs, will become operational by late 2010, with some opening in 2009. Local VA officials will keep communities and their veterans informed of milestones in the creation of the new CBOCs. Full list of proposed VA outpatient clinics. The VA and the State of Louisiana also "jointly announced the selection of adjacent downtown sites for construction of their replacement medical center projects. The two projects, called the Veterans Affairs Medical Center and the Louisiana State University Academic Medical Center, restore greatly needed health care capability lost in New Orleans during flooding after Hurricane Katrina in late August 2005." Talking Post Trauma Blues: Will Obama Make PTSD a Household Name? One of my favorite female OIF vets, Abbie Pickett, shared the following video on her facebook page. (If you're a frequent reader of PTSD Combat and wish to connect with me via my facebook account, you're invited to do so; I frequently post PTSD-related content via that channel when I'm pressed for time -- which is often when my semesters are in full-swing). The video is for a song called "Talking Post Trauma Blues." On Pearl Harbor Day, Obama makes a stellar choice. United States President-elect Barack Obama has chosen the former army chief of staff, Eric Shinseki, as his secretary of veterans' affairs. Mr Obama told NBC television that General Shinseki was "exactly the right person" to honour returning soldiers. Gen Shinseki left his top army job after disagreeing with the defence secretary over troop levels needed in Iraq after the invasion. He was the first four-star general of Japanese-American ancestry. Mr Obama made his comments ahead of a press conference on Sunday in Chicago to announce the appointment. Gen Shinseki's time as chief of staff from 1999 to 2003 was marked by constant tensions with then-Defence Secretary Donald Rumsfeld, particularly over the issue of Iraq. In 2003 he testified to Congress that it might take several hundred thousand US troops to control Iraq after the invasion. His estimate was dismissed by Mr Rumsfeld, and he was ousted from his job within months. But Mr Obama said he was suitable for the post of veteran affairs because he "was right" in predicting that the US would need more troops in Iraq than Mr Rumsfeld believed at the time. Interesting developments in the the current updating of the DSM-IV, or Diagnostic and Statistical Manual of Mental Health Disorders (generally considered the "Bible of Psychiatry"), and the ongoing push to make the process as transparent as possible. The DSM [official site | select contents] is published by the American Psychiatric Association and provides diagnostic criteria for mental disorders. It is used in the United States and in varying degrees around the world, by clinicians, researchers, psychiatric drug regulation agencies, health insurance companies, pharmaceutical companies and policy makers. The DSM has attracted controversy and criticism as well as praise. There have been five revisions since it was first published in 1952, gradually including more disorders. It initially evolved out of systems for collecting census and psychiatric hospital statistics, and from a manual developed by the US Army. The last major revision was the DSM-IV published in 1994, although a "text revision" was produced in 2000. The DSM-V is currently in consultation, planning and preparation, due for publication in May 2012. An early draft will be released for comment in 2009.